Since I’ve been asked quite often recently to publish the HACC-spatial scripts for the respective algorithm I developed in my PhD thesis, this post will list them and give a few explanations. For now, here’s the zip file with R scripts: hacc-spatial.zip. study, which is one of the main goals of data mining. 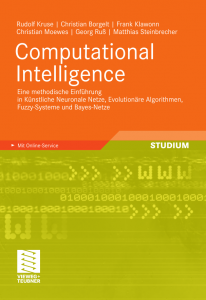 The thesis itself can be found here: PhD thesis (32MB pdf), the algorithm is described on pdf page 124 (print page 114): hacc-spatial-algorithm.pdf. Further explanations and shorter descriptions are to be found in two publications, available in fulltext: Exploratory Hierarchical Clustering for Management Zone Delineation in Precision Agriculture and Machine Learning Methods for Spatial Clustering on Precision Agriculture Data. Let me know if there are questions, comments or even successful results when applying the algorithm to your data sets. There are also two youtube videos of the clustering (with an additional pre-clustering step, the „inital phase“): F440-REIP32-movie.avi and F611-REIP32-movie.avi. It’s probably the end of both videos where it gets interesting. Compare the plots for the REIP32 variable of the F440 and F611 data sets (F440: PhD pdf page 185 (clustering on page 138) and F611: PhD pdf page 195). The algorithm was designed to work with spatial data sets: each data record/point in the data set represents a vector of values which also has a location in space (2D/3D). The data points should be spatially roughly uniformly distributed (probably with high density, although that doesn’t really matter). That is, it does not and cannot rely on density differences in the geospatial data distribution. The input structure for the R scripts is a spatialPointsDataFrame with variables. The algorithm (the function) allows to select particular variable(s) for clustering. I.e. you may use multiple variables for clustering. The algorithm is definitely not optimized for speed. It served my purposes well, but may take a while to run on your data. The contiguity factor cf is subject to experimentation. Apart from that, there’s not much to comment (yet). Let me know about questions or issues and I may be able to fix them or list further requirements here. Es geht bei http://ch.georgruss.de weiter. 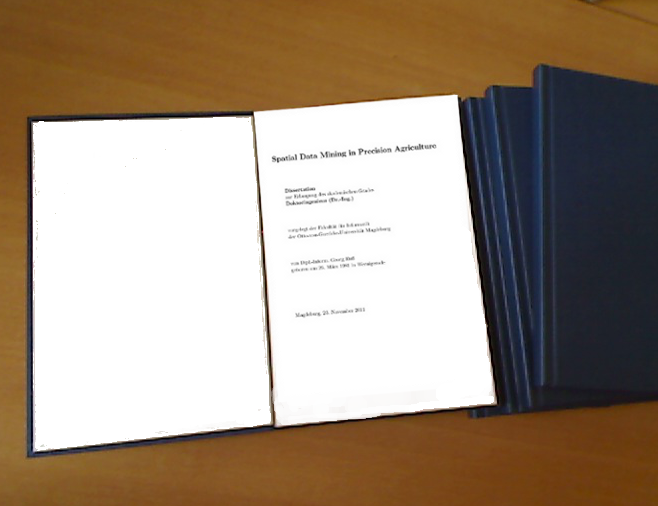 Am gestrigen 23.02.2012 habe ich erfolgreich meine Dissertation mit dem Titel „Spatial Data Mining in Precision Agriculture“ verteidigt. Hier die Vortragsfolien dazu. My novel Android Smartphone Star X18i (ordered from that particular shop), running Android 2.3.4, has been rooted using the instructions in this thread: http://forum.xda-developers.com/showthread.php?p=18615502#post8615502 (method 2b, using the zergRush exploit, v3). Nice work for the script, I just copied the instructions step-by-step. The phone itself seems to be a Sony Xperia X10 clone. Mit dem offiziellen Datum vom 23.11.2011 habe ich heute meine Dissertation eingereicht. Jetzt ist der FakultÃ¤tsrat dran, dann sind es die Gutachter und wenn alles glatt lÃ¤uft, bin ich bei der Verteidigung dran. Vorbehaltlich der Genehmigung durch den FakultÃ¤tsrat findet die Verteidigung am 23.02.2011, 15 Uhr, in 29-301 statt. Der Dissertationstitel entspricht der Ãœberschrift dieses Blogs. FÃ¼rs Binden habe ich Ã¼brigens 42 EUR bezahlt. Das kann doch kein Zufall sein! There’s a preliminary deadline for handing in my thesis. I’m not sure whether I’m going to make it, but 2011-10-19 has been set as my personal deadline, before the thesis draft goes again to my supervisor. Lots of improvements yet to do. The official one is then 2011-11-23. The site’s header has been changed to reflect the actual topic of my PhD thesis. Well, I updated the minihomer script described in this post. The issue was that the old script just output one GPX file describing the complete miniHomer’s log — currently around 23MB, comprising two continents. Although the GPX file is internally grouped into tracks, it’s quite cumbersome and slow to open with viking (which is not viking’s fault). Therefore, I added a few lines to use the gpxsplitter python script at the very end in the „dump“ option. It simply takes the existing gpx file and outputs single files containing just one track, which is exactly what I wanted.